Deviant Behavior challenges students' own biases and preconceptions. 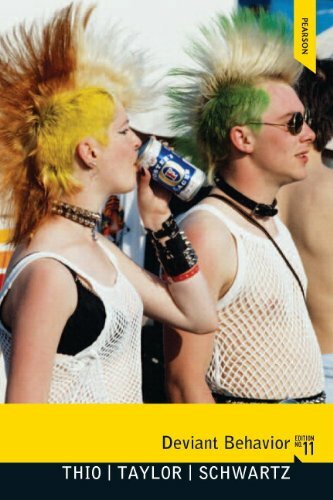 This best-selling text offers comprehensive coverage of all aspects of deviance and is noted for its blend of style and substance. Deviant Behavior covers a wide spectrum of theories of deviance, and analyzes numerous specific deviant behaviors. The author uses an abundance of research data, including many that debunk our common assumptions about deviant behavior. Students are exposed to the full range of theories and data about deviance, and are challenged to think about and evaluate their own biases and preconceptions. Learning Goals Upon completing this book, readers will be able to: * Analyze numerous types of deviant behavior. * Challenge their own biases and preconceptions on deviant behavior. * Make connections between behavioral theories and concrete deviances. * Develop new ways of seeing and understanding chapter material through critical thinking questions. Note: MySearchLab with eText does not come automatically packed with this text. To purchase MySearchLab with eText, please visit www.mysearchlab.com or you can purchase a ValuePack of the text MySearchLab with eText (at no additional cost): ValuePack ISBN-10: 0205929915 / ValuePack ISBN-13: 9780205929917. Alex Thio is Professor of Sociology at Ohio University. Born of Chinese parentage in Penang, Malaysia, he grew up in a multicultural environment. He acquired fluency in Mandarin (modern standard Chinese), Malay, and Indonesian. He also picked up a smattering of English and Dutch. He took French and German in high school and college. Professor Thio attended primary school in Malaysia and high school in Indonesia. He then came to the United States and worked his way through Central Methodist College in Missouri, where he majored in social sciences. Later, he studied sociology as a graduate student at the State University of New York at Buffalo, and he completed his doctorate while working as a research and teaching assistant. Professor Thio regularly teaches courses in deviance, introductory sociology, social problems, and criminology. In addition to teaching, he enjoys writing. He is the author of the Sociology: A Brief Introduction, Society: Myths and Realities (Penguin Academic), and Deviant Behavior.